Frost-covered black metal from the icy depths of Scandinavia is one of those metal genres that you either like or hate. Much like the rest of the metal genres, there are quite a number of sub-variants incorporating everything from operatic female vocals to ambient keyboard passages. A sub-genre that I myself have found to be particularly interesting and enjoyable is often referred to as Viking metal - mid-paced black metal often with clean choruses and the inclusion of traditional instruments and folk melodies. 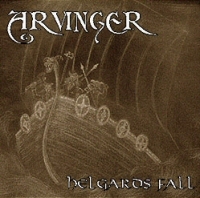 Norway's Arvinger is a young band of the Viking metal style, with Helgards Fall being their first full-length release. The band is comprised of the duo of Djerv on vocals and Hauk on everything else, though several guests appear on the album. For those familiar with the common threads of black metal, much is as you would expect it to be on Helgards Fall. The production is extremely bare, which serves to enhance the bleak attitude of the music, the keyboard passages are eerie and the guitars are incisive. Of course, the package wouldn't be complete without raw, raspy vocals sounding as if they were being sung from beyond the veil. Thus there is much for black metal purists to enjoy on this album. For those looking for just a bit more than the average icy blasphemy, Arvinger incorporates a substantial amount of folk melodies and even brings in a fiddle to heighten the variety. Highlights for me include "Hyllest", a song that incorporates ominous keyboard passages and a female soprano along with heavy riffs to construct a menacing tune. The instrumental track "Morkets Dal" is essentially Hauk's opportunity to run wild and let his six-string skills shine. Clearly not pigeonholed in the breakneck riffs of black metal, Hauk delivers some first-rate extended solos and an expressive acoustic interlude. Female vocals appear again on "Kalt Ved Navn", though from a different singer whose voice isn't as powerful as the previous soprano. Still, the inclusion of both women gives Helgards Fall added depth and make it a breath of freshness in a crowded genre.